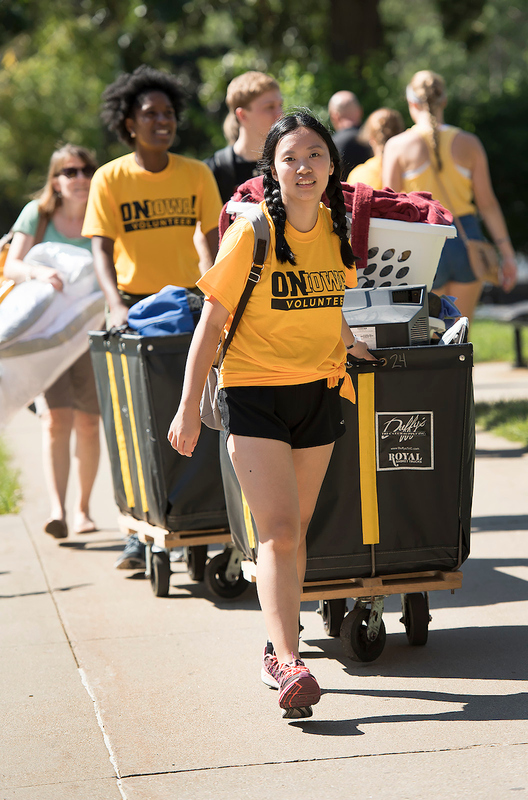 Thousands of first-year students moved into residence halls across the UI campus on Aug. 17 and 18. 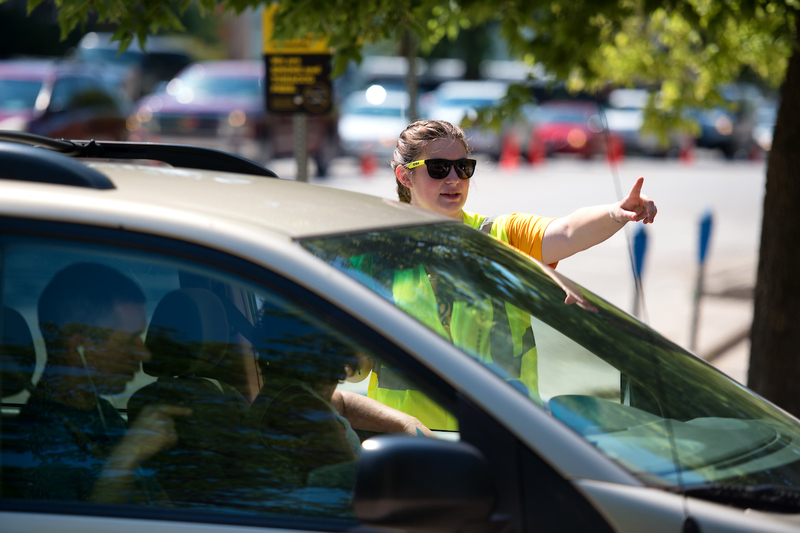 About 3,000 students were expected to arrive each day, with move-ins scheduled in shifts. Photo by Tim Schoon. It was during the family’s final dinner together that the reality of her oldest child leaving home truly hit Pam Benacka. Her 18-year-old daughter, Gabrielle, was a Hawkeye now, a first-year student majoring in journalism at the University of Iowa. As Pam followed Gabrielle into Petersen Residence Hall and up to the fifth floor, she says she thought about an empty chair at the dinner table and felt a tug at her heart. 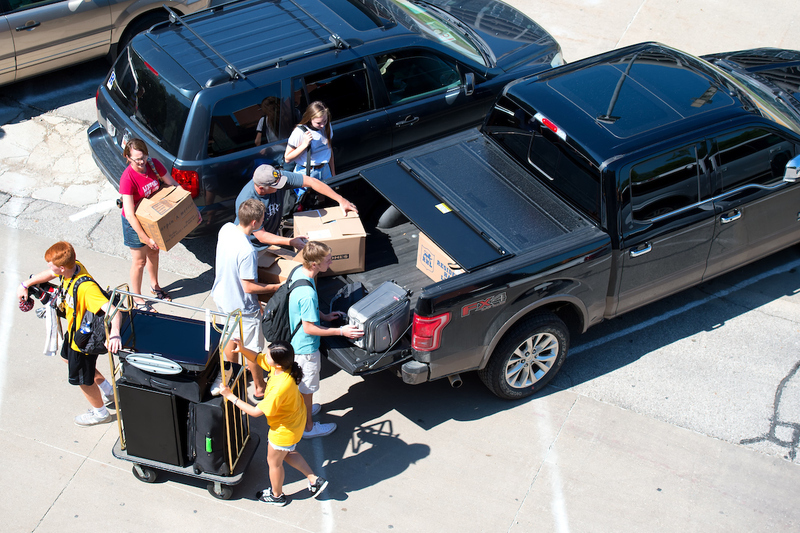 Hundreds of vehicles cycle through these parking spots throughout the move-in period. Photo by Justin Torner. “Oh, Mom, you won’t even notice,” Gabrielle says. 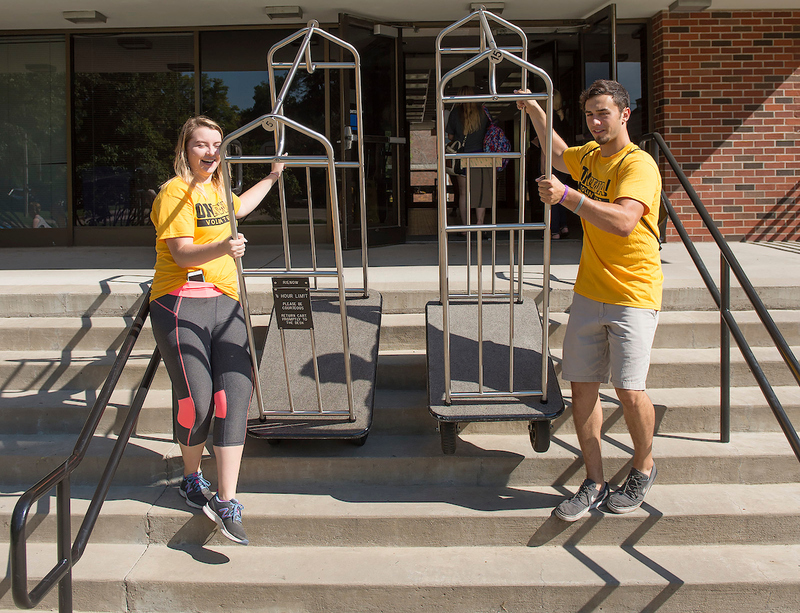 Pam and Jeremy Benacka, of Maple Grove, Minnesota, were among thousands of family members moving their first-year students into residence halls across the UI campus on Wednesday and Thursday, Aug. 17 and 18. 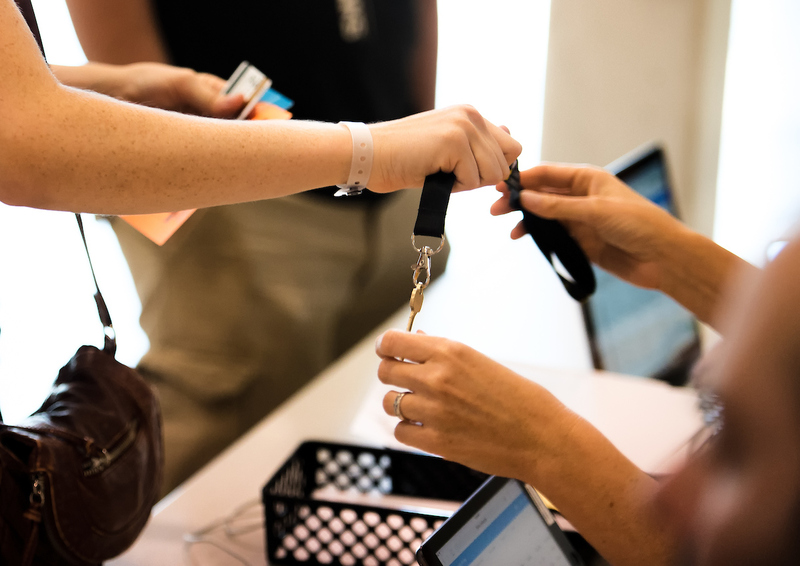 About 3,000 students were expected to arrive each day, with move-ins scheduled in shifts. 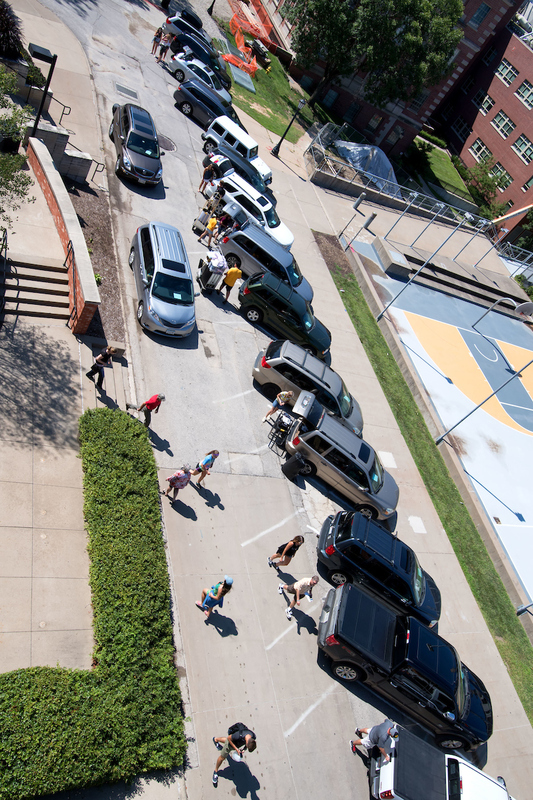 As families arrived, each vehicle was met outside the residence hall by an On Iowa! student volunteer who directed them to a parking spot. Next, volunteers helped each family unload—stacking boxes, totes, crates, duffel bags, and more onto large rolling carts. 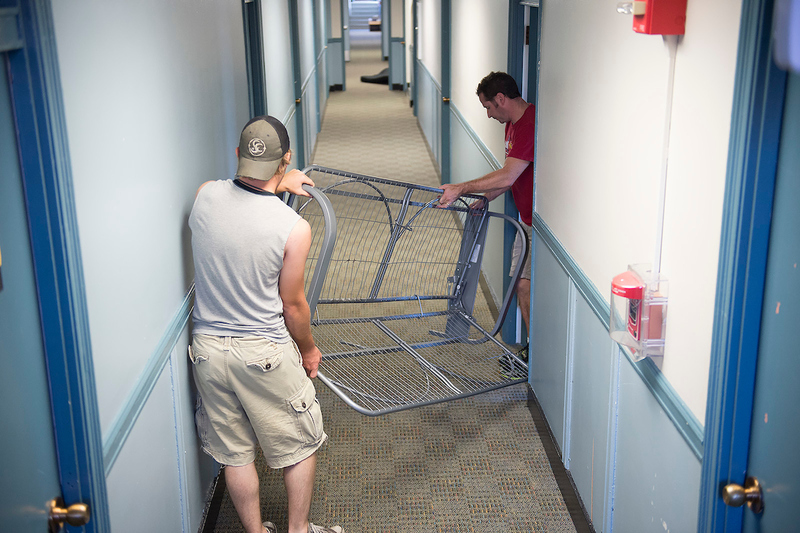 Amid the parade of college gear, dads lugged microwave ovens, mini-fridges, and flat-screen TVs, while moms fretted over the plight of lamps, mirrors, and clothes dragging on the concrete. “Be careful!” one mother shouted as her daughter fumbled with a wall hanging perched precariously on a stack of pillows. 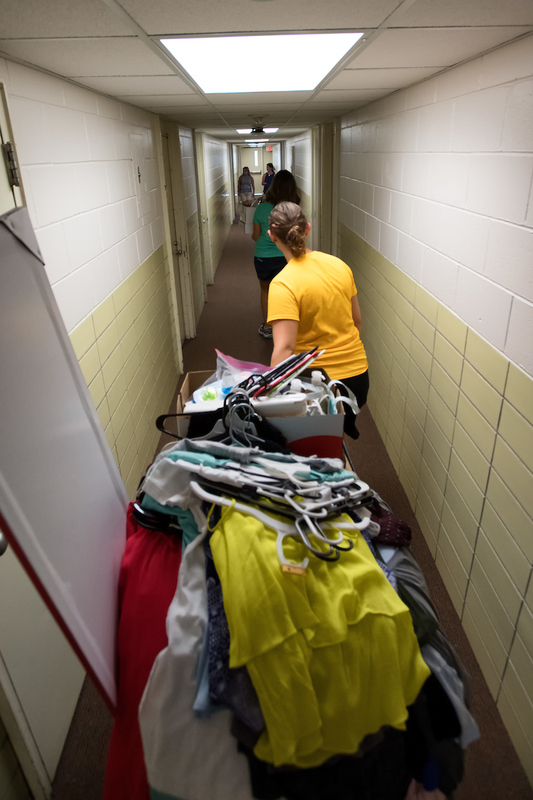 While Gabrielle and other students moved into Petersen Hall, Resident Assistant Bryan Porter was next door at Hillcrest, where all 40 students on his floor were set to move in on the same day. 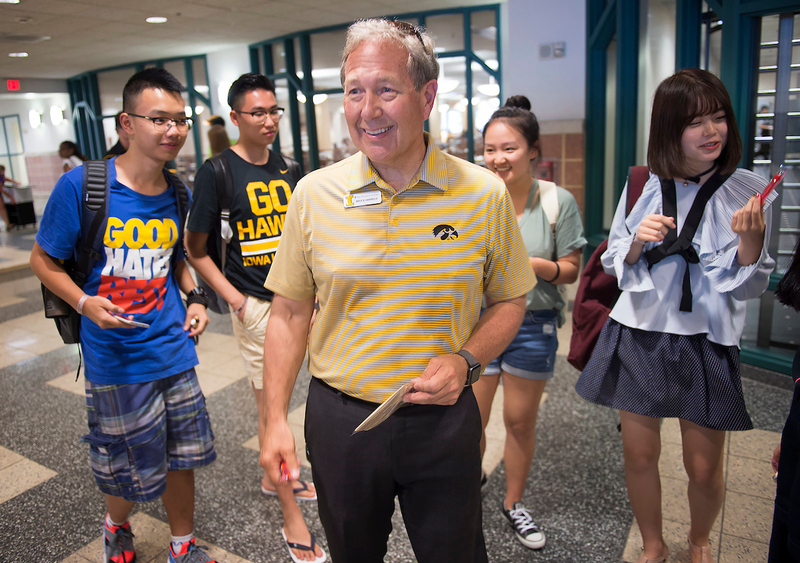 Porter lived in Hillcrest Hall during his first year at the UI and was an RA there last year. He has the move-in process down to a science. 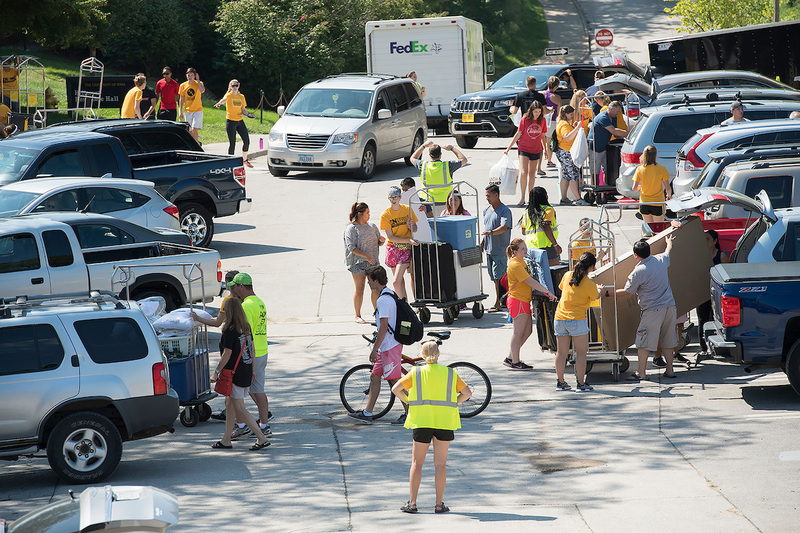 On the east side of campus, cars, trucks and SUVs lined the curb in front of Burge Hall, where Kim Rossiter, of Winfield, Iowa, marveled at how un-chaotic the process was—not at all what she’d envisioned. Her son, Kolt, who plans to go into nursing, is her first child to leave home for college. 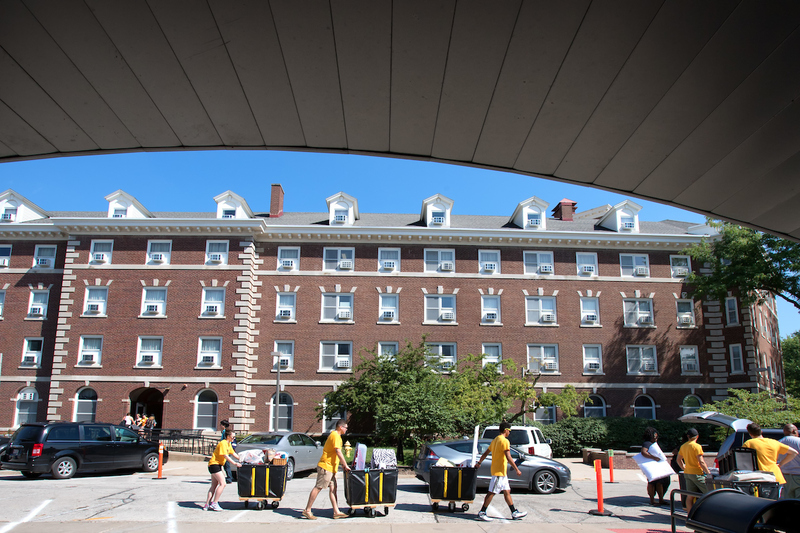 “I really expected it to be more congested than this,” she says, standing by her vehicle as the string of students, carts, and families snakes in and out of the residence hall. 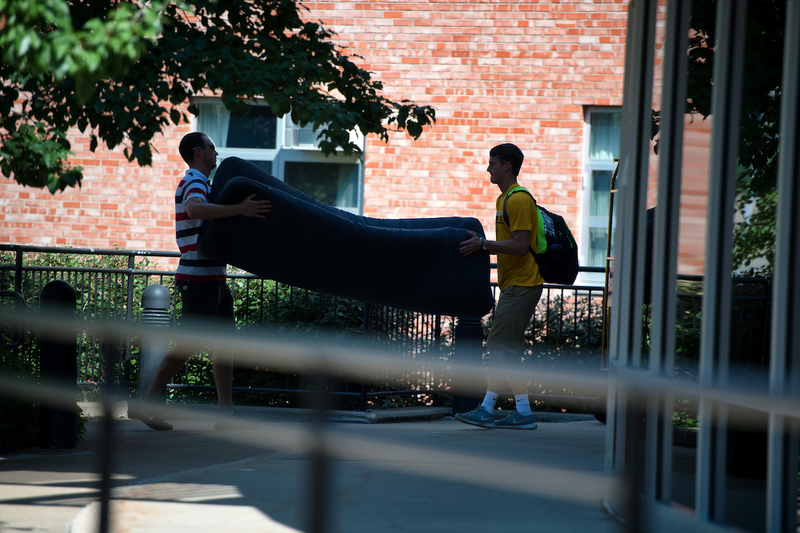 Kolt bounded out of the building and toward his mom, ready with two friends to carry his futon up to his room. 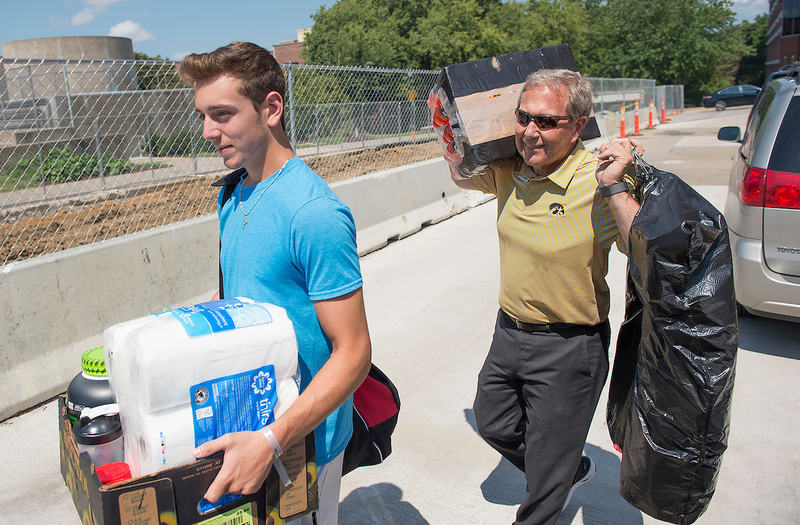 Steve Potts drove to Iowa City from Chanhassen, Minnesota, to help his son, Nolan, move into Burge Hall. His daughter is a senior at the University of Wisconsin–Madison. Potts and his wife already downsized to a townhouse, and the prospect of becoming empty-nesters is still sinking in. 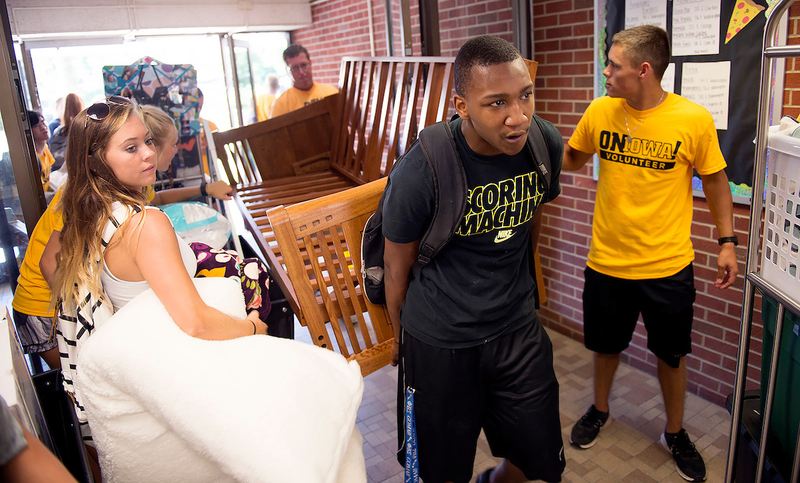 Nolan Potts, 18, remembers helping his sister on move-in day and was grateful the UI had volunteers ready to lend a hand. A business major, the younger Potts looks forward to the next phase of his life.